I headed to the Fontainebleau forest on my bike to get my body feeling a bit better after the big ball. It's cool to have a forest practically at your back door and no bears or cougars to worry about. And the weather right now is so pleasant; even when it rains. Somehow this magical combination of conditions lends itself to feeling lie a kid again. Of course, that may be the unemployment talking, too. So, in the spirit of feeling and living like a kid, I rode down to Montigny, where most of my friends are living, for a dip in the river. 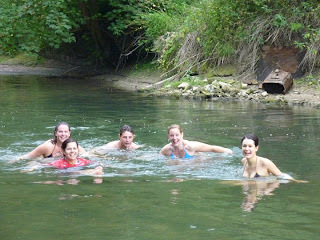 I can't remember the last time that I went swimming in the river. This one was a LOT warmer than the Bow, too. Ah, to be a kid again.